Ah, Japanese knotweed – the villainous vine of vexation, the botanical ninja of nature, the stealthy samurai of the shrub world! A thorn in the side of many a property across the UK, this leech of the land has seen numerous properties fall in its wake and countless more fall in value by its mere presence. A devastating addition to any home, this is one problem plant you’re definitely going to want to nip in the bud. As Sir Francis Bacon once said, “knowledge is power”, so let’s get to work and get acquainted with the knotty pest from the Pacific. Luckily, here at Taylor Weed Control, we’ve got your back on this one with enough factual ammunition to take the fight to your garden plight – and win! So, prepare to lock and load with these top facts about Japanese knotweed. A non-native plant from the East, Japanese knotweed was actually brought into Britain as an ornamental plant in the early 19th century. This introduction is commonly attributed to German physician, Philipp Franz Balthasar von Siebold, who was also a traveller and botanist. While his studies of Japanese flora and fauna brought him national prominence, the invasive species of knotweed he brought with him eventually spread into the wild and has since become part of the British ecosystem, albeit an unwelcome one at that. 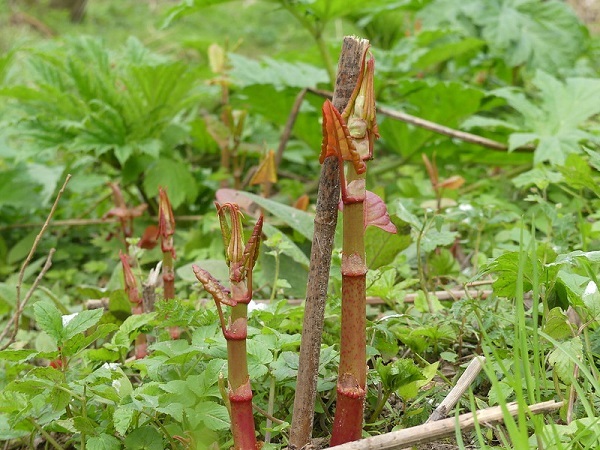 As the previous fact may suggest, Japanese knotweed has been known to spread at an impressive rate. In fact, it can sprout up as high as three metres tall in as little as six weeks, towering over you for all to see like the invasive inconvenience it is. Japanese knotweed is also surprisingly strong and can cause structural problems to a property, roads and drains, particularly if there are existing cracks for it to grow through. Worse still, it has alarming regeneration powers and a tiny rhizome can form a new plant if handled incorrectly. So, even if you think you have seen the last of this annoying weed, it could quite literally come back to haunt you if not effectively treated. Japanese knotweed is part of a collective of flowering plants known as the smartweed family. Now, while that title may give the impression that this plant is highly intelligent, capable of engulfing mankind with its superior intellect and guile, it’s also worth knowing it’s not the only name given to this botanical tribe. These same “smartweeds” are also commonly known as the Buckwheat family, characterised by simple design, toothless leaves and swollen joints – which immediately seems infinitely less intimidating and far more like a casting call for a Deliverance remake. While most posts about Japanese knotweed will malign the plant as the housing hindrance it is, there are some in the nutritional world that have a wholly different take. Japanese knotweed is actually known to be a source of resveratrol, a plant compound that acts like an antioxidant. While resveratrol is also present in other accessible foods – including grapes, peanuts and red wine – Japanese knotweed is also deemed an edible source. Not only that, it’s actually considered a delicacy in Japan and can provide several health benefits. According to LiveStrong.com, resveratrol found in knotweed may help prevent heart disease, cancer, diabetes and early signs of ageing. However, it’s also noted that it can have a variety of negative effects as well, including drug interactions, so do your homework if you do decide to tuck into your garden guest. With all the widespread scaremongering, a Japanese knotweed discovery on your property can understandably strike fear into the hearts of anyone. However, it isn’t the end of the world, so don’t call in the bulldozers just yet. Remember, it’s just a weed – it’s nothing to soil your plants over. That being said, in order to weed out this horticultural headache from your garden, you’ll need more than a pair of sheers and an appetite for destruction. A topiary trim won’t cut it, so be prepared to dig deep and get your hands dirty. While it can be a massive inconvenience and prove pricy to get rid of, it is a problem that can more often than not be rectified. Now that you’re well acquainted with Japanese knotweed, you’re probably wondering what’s the best course of action to take if you have an unwelcome visit from the dreaded plant. If you catch it early, it can be fairly easy to treat; however, the longer you leave it, the more complex (and costly) it can become – so don’t delay if you spot the knot! Like any ailment, your best bet is to contact an expert for detection, diagnosis and treatment advice. Luckily, Taylor Weed Control is one of the leading Japanese knotweed specialists in the UK, with over 15 years’ experience fighting this familiar foe. At Taylor Weed Control, we provide honest and transparent advice, “Taylor-made” to help rid you of this pesky plant for good. If you suspect you have Japanese knotweed on or around your property, contact us today and request a free survey! Request a FREE survey now!